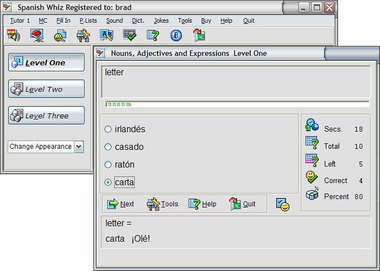 The Spanish Whiz program contains most of the common vocabulary and verbs which exist in the Spanish language while making an extra effort to give you practice in typical problem areas such as ser and estar, por and para, prepositions, the imperative forms, the subjunctive and idiomatic expressions. You can test yourself in both multiple choice and fill-in question format with the more than 35, 000 ready-made questions, and you can make your own word lists. As well as including a dictionary and the ability to record your progress in a log file, the program has Sound capability to help you with your pronunciation and listening comprehension. Extra sound files are available.